This clip is new being made today. This molding clip #1032 is said to be for the 1962 Chevy Nova and is found on the top of the door. It is also said to be used in the same location of the 1962 Buick Skylark. At this time I don’t have a large quantity in stock because they are new to my inventory but they are being made today so quantity needed should not be a concern. If you need more than I have in stock, email me at [email protected], tell me what you need and I will order more in. I strongly suggest you compare the picture and measurements I provide to any original examples you may have. 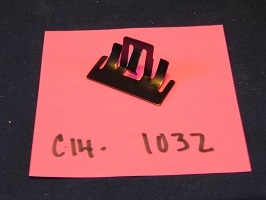 There are not very many measurements to give on this clip and the picture give a good look but the clip is 1 1/2 in. long and stands up 5/8 in.